I keep my patch of eczema hydrated as often as possible and I try not to take overly hot showers. Stress is certainly a factor for this sudden outbreak along with the changing weather. My body care routine has been the same for many months so I feel confident that is not the cause. It doesn't help the eczema is in the place it is as my bra rubs. The Jubilee weekend was a perfect time to see my parents and extended family. I have mixed feelings about the Royal Family so did not take part in any celebrations. I did catch some of the highlights on TV whilst spending time with my parents and the family dogs. Both of them are now old age pensioners in the dog world. Our Shih Tzu he is a funny little chap but blind in one eye. As for our Cavalier King Charles she doesn't have many teeth left so her tongue is always hanging out even when asleep. I did get sucked into the magazine freebies last week and picked up Ciaté Jelly Bean. It is a brand I had my eye on as Ciaté is a 5 FREE brand which is free of formaldehyde, toluene and DBP (dibutyl phthalate), formaldehyde resin, camphor and cruelty free (never tested on animals). In the past week I have had a few free from indulgences. I stocked up on some dairy free chocolate. I had been longing to try Plamil White Chocolate and it was a huge disappointment. The white buttons remind me of milky way bars but the Plamil didn't taste like chocolate dupe. I found a trail mix at Holland & Barrett that was rather tasty. The All-Bran breakfast biscuits (Chocolate) are okay and only have a "may contain traces of milk" label. 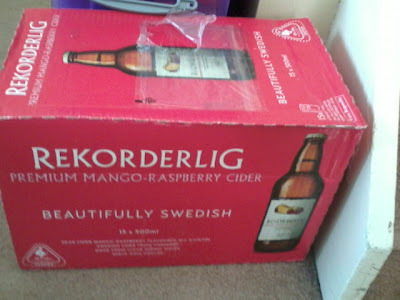 A few weeks ago I was one of the winners of a Rekordelig giveaway being held on Kat's blog (Jemima and Ted). My prize arrived on Friday although I did have to wrestle it out of the hands of my work colleagues (all male office!) as my name was not on the delivery slip. I cracked open a bottle when I got home and can tell you this stuff is delicious. I'm not usually a lover of cider but this is like frizzy fruit juice.